"Gelobet seist du, Jesu Christ" ("Praise be to You, Jesus Christ") is a Lutheran chorale of 1524, with words written by Martin Luther. It was first published in 1524 in the Eyn geystlich Gesangk Buchleyn. For centuries the chorale has been the prominent hymn (Hauptlied) for Christmas Day in German speaking Lutheranism, but has also been used in different translations internationally. It has appeared in hymnals of various denominations including the Catholic Church. Luther expanded a pre-Reformation stanza which is attested in Northern Germany in the 15th century, mainly in prayerbooks from the convent of Medingen, based on Grates nunc omnes, the Latin Sequence of the midnight mass for Christmas, by six stanzas. Each stanza ends on the acclamation Kyrieleis. 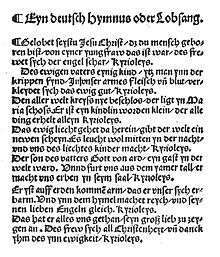 The hymn was published in Eyn Enchiridion in Erfurt in 1524. The tune was first printed in Eyn geystlich Gesangk Buchleyn, a booklet of spiritual song, collected by Johann Walter but is attested also in the prayerbooks from the convent of Medingen and even appears on an antependium made by the nuns in the late 15th century. It seems likely that both Luther and Walter collaborated to modify an older melody. In the first verse, the highest notes accentuate important words such as Jesu, Mensch (man), Jungfrau (virgin), Engel (angels). Balthasar Resinarius composed a chorale motet, printed in 1544. A setting of Walter is dated 1551, Antonio Scandello's 1575. Lucas Osiander wrote a four-part setting in 1586, Erhard Bodenschatz in 1608, Samuel Scheidt wrote two settings in 1650. A five-part motet of Johannes Eccard was printed in 1597, one of Adam Gumpelzhaimer in Augsburg in 1618, Andreas Raselius wrote a five-part setting in 1610. Melchior Schärer (1570–1602) set the hymn as a motet a cappella for three parts, and Michael Praetorius composed various settings. Johann Hermann Schein wrote a cantata for three parts in 1618, Johann Crüger set it for four voices, two obbligato instruments (violins) and continuo. Johann Sebastian Bach's used single stanzas for Christmas music, he inserted stanza 7 in his cantata Sehet, welch eine Liebe hat uns der Vater erzeiget, BWV 64, written for the Third Day of Christmas 1723, and included in his Christmas Oratorio both stanza 6 in movement 7 in combination with recitative and stanza 7 in movement 28. Bach used the complete chorale as the base for his chorale cantata Gelobet seist du, Jesu Christ, BWV 91, composed in Leipzig for the Christmas Day of 1724. Cantatas were composed by Gottfried August Homilius, Friedrich Zelle (1845–1927), and Kurt Hessenberg, who wrote in 1935 a chorale cantata for mixed chorus, two solo voices, organ and orchestra, op. 9. The hymn inspired organ settings by Protestant Baroque composers such as Dieterich Buxtehude, Johann Pachelbel, Georg Böhm, Bach, Homilius, Johann Christoph Altnikol and Johann Philipp Kirnberger. It is used prominently in Felix Mendelssohn's Piano Trio No. 2 as the culminating melody of the finale. Robert Schumann used the chorale for the theme and variations in the third movement of his Violin Sonata No.2 in D minor, Op. 121, changing the meter to triple time. Wikimedia Commons has media related to Gelobet seist du, Jesu Christ. 1 2 John Julian (1907). "Texts " Gelobet seist du, Jesu Christ, das du Mensch". Dictionary of Hymnology. Retrieved 14 December 2010. 1 2 "Gelobet seist du, Jesu Christ / Text and Translation of Chorale". bach-cantatas.com. 2008. Retrieved 13 December 2010. ↑ Henrike Lähnemann, An dessen bom wil ik stighen. Die Ikonographie des Wichmannsburger Antependiums im Kontext der Medinger Handschriften, in: Oxford German Studies 34 (2005), pp. 19-46. 1 2 3 4 "Gelobet seist du, Jesu Christ / Chorale Melodies used in Bach's Vocal Works". bach-cantatas.com. 2008. Retrieved 13 December 2010.